Florent Morellet, in a scene from the movie. Courtesy The Villager. When talking to Florent Morellet, don’t call it the Meatpacking District. For the eponymous owner of now-closed diner/bistro Florent on Little West 12th Street, it’s the Meat Market. Well before SoHo House and long before Pastis, there was Florent, the subject of a new documentary by David Segal, Florent: Queen of the Meat Market. I found out about the New York opening of the film while showroom hopping on Green Street last week. At Kartell, the perfectly bouffant-ed Darinka Chase encouraged me to try out Philippe Starck‘s Magic Hole. Before slinging chic plastic, Chase spent twenty years as hostess at the downtown den of dining debauchery. She vividly recalls how preservationists met at the restaurant in an effort to preserve the district. “At the time people did think it was kind of nuts, like landmarking the city dump,” she said. Darinka Chase lounges in Phillippe Starck's Magic Hole chair at Kartell. 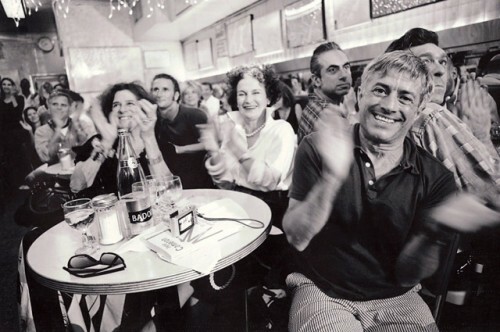 The eatery was always a hub for a lot of left-leaning causes, acting as a gathering place for gay activists, AIDS activists, fringe artists, and, much later, for preservationists. When the neighborhood took a turn toward high fashion, the area’s characteristic metal awnings started coming down. The film devotes a good bit of time on how Morellet helped mobilize the community and suggests that, in many ways, Florent became a victim of its own success. After obtaining landmark status, the neighborhood became more desirable, the rent skyrocketed and the restaurant was forced to close. During a question and answer session following the film I asked Morellet, who now sits on Manhattan Community Board 2, what he thought about the High Line and the influx of contemporary architecture to the area. Citing the Ennead designed Standard Hotel and SHoP’s Porter House as great architecture in “conversation” with the neighborhood, he said that without it the Meat Market would look like an industrial neighborhood in any other city.